BOI AXA Tax Advantage Fund – Very low asset under management. Only 142Cr. 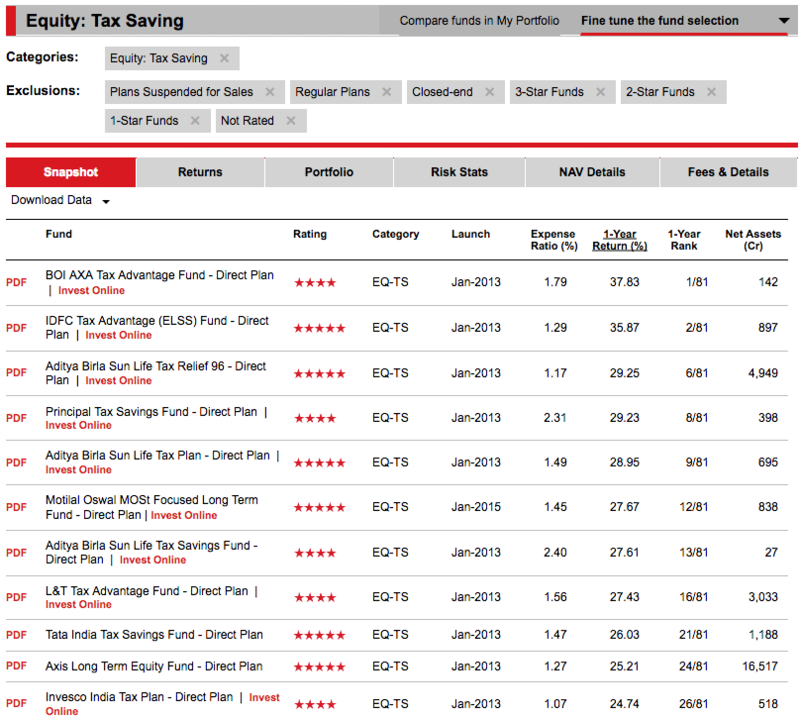 Principal Tax Savings Fund – Very high expense ratio. Doesn’t make sense of such high expense ratio for a direct fund. Aditya Birla Sun Life Tax Plan – Multiple funds in the same category by the same fund house. Only considering the other fund with higher asset under management. So from the other top funds, we nail down further as follows. ELSS funds have a lock-in period of 3 years. So we have to choose a fund which can outperform in the coming 3 years. Based on the company results and management interviews that I have been following, pharma sector will have pain for the next few quarters but is more likely to outperform in the time frame of next 3 years. A fund having more weightage on Pharma sector will be my preferred choice of tax saving fund for 2018. 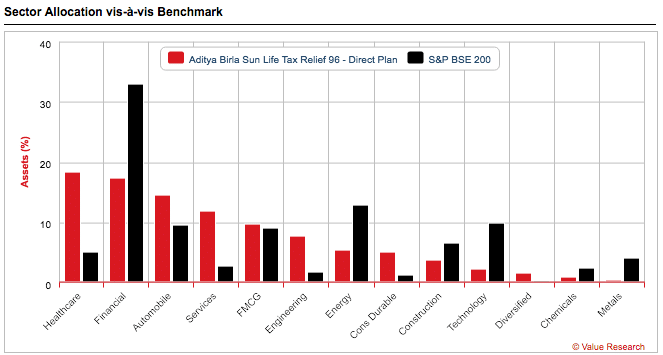 Aditya Birla Sun Life Tax Relief 96 is a fund among the top-rated ELSS tax saving fund that has higher weightage on Pharma and automobile sector and has lower weightage on financials. It aligns with my views of the market where I believe the financial sector will not outperform the market to the same extent it did earlier. Pharma and automobile have higher chances of outperformance. The other best ELSS tax saving fund I like is the focused fund by Motilal Oswal where they invest in fewer companies taking a focused approach to investing. I am more inclined to the focused approach to investing. I believe in the tough time for the market in 2018, focus investing is more likely to outperform. 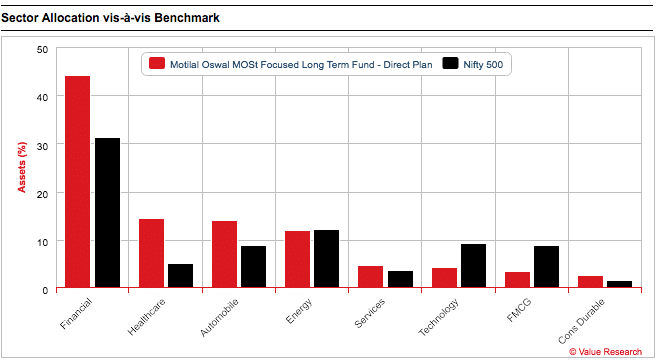 On top of it, Motilal Oswal MOSt Focused Long Term Fund also has higher weightage on healthcare and automobile sector. How The Best ELSS Tax Saving Funds for 2017 Performed? In 2017 the performance of the all the indices has been more than 30% which makes the performance of the best tax saving funds of 2017 look not that good. DSP BlackRock Tax Saver Fund – The performance of the fund hasn’t been as impressive as one would have liked it to be. It has managed to give a return of 20% for the past one year which is in line with its benchmark as of now as well as inline to its own 5-year performance. Fund managed to do well though slightly better returns would have been awesome. This is not an endorsement that you should invest only in the above mention funds. 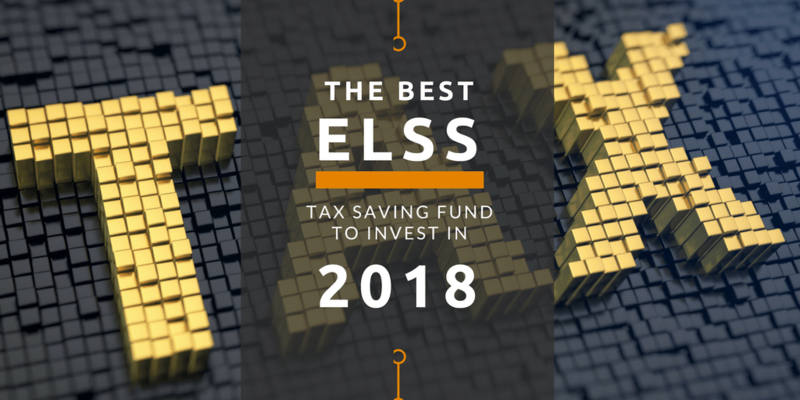 I have shared the complete process I used to find the best performing ELSS tax saving fund for 2018 which aligns with my views. Feel free to apply your own views or any other criteria of your choice. Just make sure to invest in the direct funds and aren’t selecting a fund because someone has recommended it to you.